That didn’t take long. 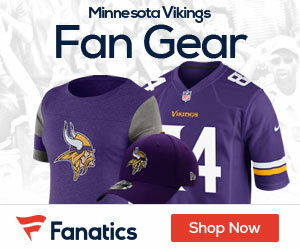 Just one week after him joining the team, there’s reports that Brett Favre is already causing some kind of division in the Vikings locker room. Adam Schefter of ESPN ran that report last night, and now it’s making national headlines. Two of the veteran starters spoke on the record. “I’m in the mix, but I haven’t heard anyone talk about that,” starting tight end Visanthe Shiancoe said. “The locker room is not divided at all. “Everyone is going to have their own opinions, and everyone is not going to like everyone all the time. But we don’t have time for that dumb (expletive).” Vikings Pro Bowl defensive tackle Pat Williams said he hadn’t heard any whispers about a possible rift regarding the quarterbacks. This comes after last season the Jets locker room also reportedly became divided after Favre showed up, and we all know how that ended. 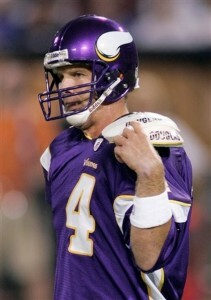 It will be interesting to see how this story progresses as Favre continues wearing purple.